This year the events are going to be more health oriented and to start off with is going to be an interesting yet challenging theme..Pregnancy Food. The three trimesters have different nutritional requirements but the most important nutrients required throughout pregnancy are the Calcium, Iron and the Folic acid. The pregnant woman is advised to have 5 small meals a day rather than 3 big meals. Keeping all this in mind, create recipes that a pregnant woman can eat in small portions. See that the food is not very spicy and produce heat in the body as it can cause heart burn. The giveaway cookbook for the winner of the event is sponsored by www.tarladalal.com. 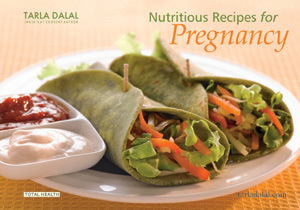 It is a book called Nutritious Recipes for Pregnancy. This book has a wonderful collection of recipes which are innovative and healthy. The book can be won by followers of my blog through g+ and Google Friend Connect. The book gets shipped in India only, so the winner needs to provide an address in India. Bloggers & Non bloggers can participate in the event. Any number of new entries can be linked but only two entries from the archives will be accepted. The posts need to be linked to this event announcement. Use of logo is compulsory as it helps spread the word. Only vegetarian recipes will be accepted (eggs are allowed). There will be two link-ups. One for those having an address in India and the other for those who can not provide an address in India. The book is given only to the followers of this blog. In case you have a problem linking and also the non bloggers can send their entries to cookingoodfood@gmail.com. Please link your recipe only once using any one link-up. Failing to follow the rules 2,3,4 & 5, the posts will be deleted from the Link-ups without a notification. So please read rules carefully. by mistake i linked my entry in the category without valid address in india , please take a note of it. Thanks for the information, and it good to be on your site, hope there will be new post on your site. Hey Pari... Just realised that I linked my moong dal in the wrong category.. Please delete it from there.. Also have linked it in Indian residents recipes now..